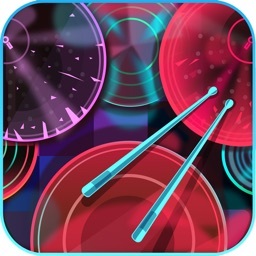 DrumJam is a whole new world of percussion and drums for the iPad, iPhone and iPod touch. 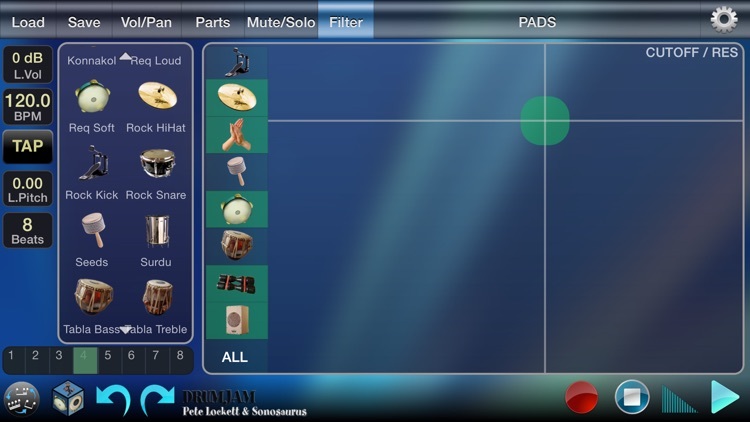 Designed by award winning international percussionist Pete Lockett and Sonosaurus LLC, the developer of ThumbJam, this app is a real first for percussion. 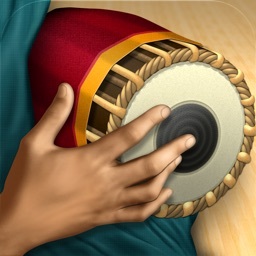 It's an exciting and powerful tool, opening up the world of rhythm in a completely hands-on and inspiring way. 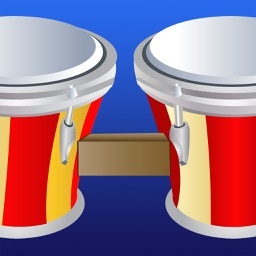 Whether you are a novice just looking for a bit of rhythmic fun, a songwriter or producer looking for a fresh rhythmic idea, a percussion student writing arrangements for a project, a music teacher looking for rhythm ideas to teach, or a drum circle facilitator seeking to expand their repertoire, this app has something for you. Pete Lockett has been top of his game for decades and has performed with the stars, from Peter Gabriel and Bjork to Robert Plant, Dido, Jeff Beck and many more. He has also worked extensively in the film industry, arranging and recording all the ethnic percussion for five Bond 007 films. 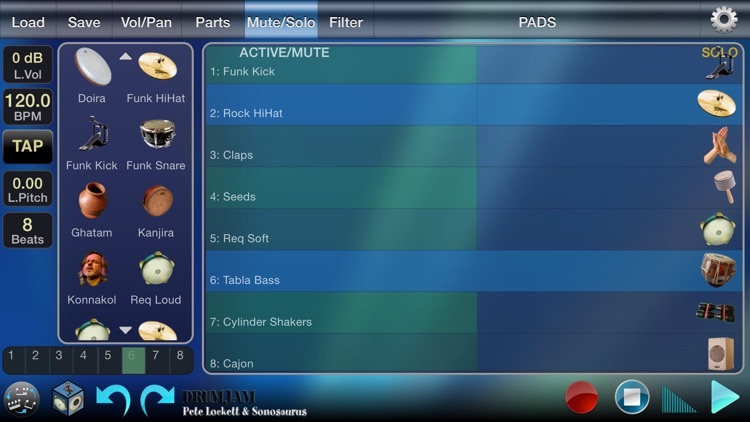 The app is a direct and personal route to his rhythm factory with all the individual percussion parts recorded by Pete. These are not ineffective sequenced patterns but actual recorded audio waiting to groove with rhythm at multiple tempos through your very own mobile device. Through his decades of studio experience Pete has become a master of layering various percussion instruments into mesmerising rhythm fabrics and flowing grooves. 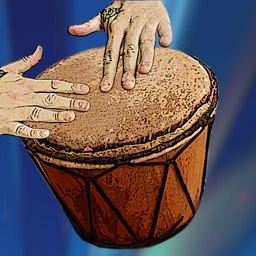 Shakers and congas interwoven with Indian ghatam, pop drum set and Arabic req or else a Carnatic kanjira with some Cuban bongos, Latin cowbells, rock drum kit, seed shakes and surdu. 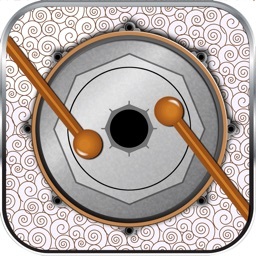 There are dozens of different looped instruments to choose from, each with up to 20 different patterns. You can change the levels, alter the pan, mute, solo, and tweak a low-pass filter giving you a great degree of flexibility over each individual part. 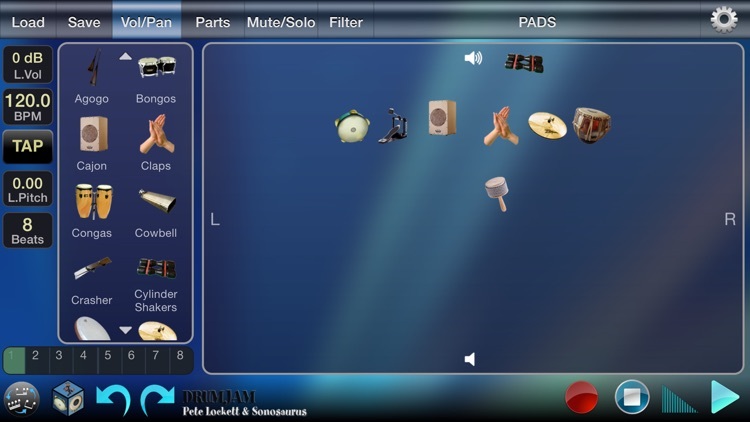 Or simply press the random button to randomise all (or some) the parts and get some really funky and unexpected changes. It can even automatically randomise periodically for hands-free unpredictability. The excellent time stretch system and multiple-tempo loop recordings mean that you can get great natural sounding audio across a wide tempo range. Change the number of beats to use in the loops to alter time signature. Pick from a wide range of solo instruments where you can jam away over the top of the grooves you create. 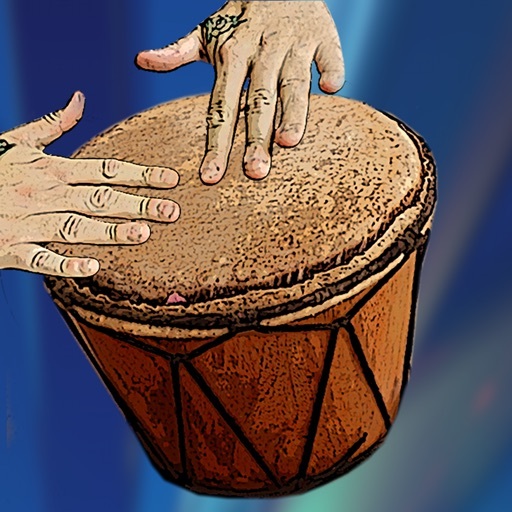 These include all sorts of ethnic percussion instruments from Kanjira and Ghatam, to Djembe, Bongos, Dube and Cajon, and more. 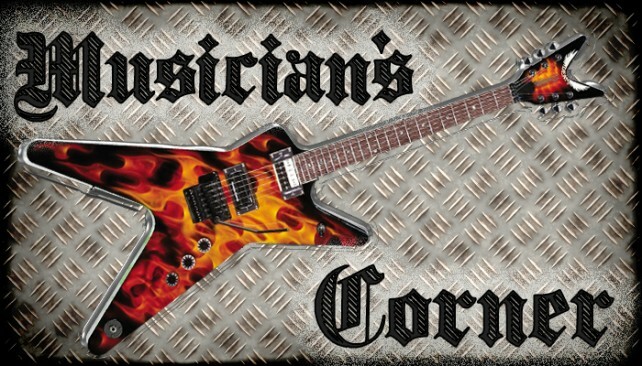 There are also custom drum kits from great drummers such as Johnny Rabb, Russ Miller, KJ Sawka, Dave Langguth, Steve Sidelnyk and Scott Pellegrom. With a detailed and complete range of quantize options performed by simply dragging your fingers around, it is possible for even the absolute novice to get some funky grooves immediately. 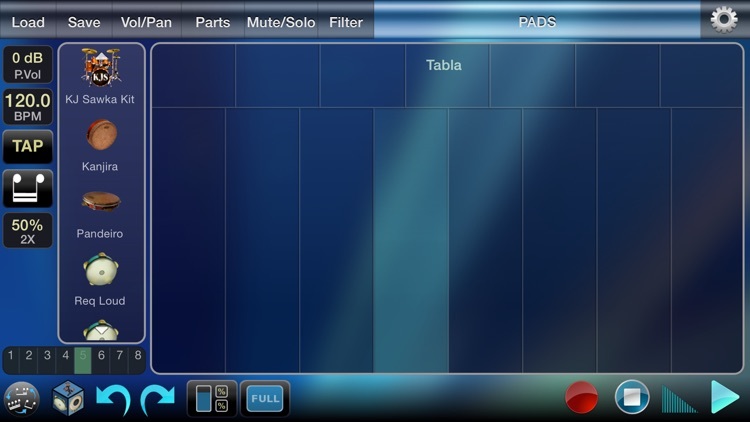 Additional loops and pad instruments are available for in-app purchase, but rest assured that the base app is loaded with kits and loops! There are also incredible filter, pitch bend, delay, reverb, lofi, and distortion effects available for the solo instruments, which really adds a whole new dimension of live performance possibilities. With multiple save and export options, it is possible to record loops or a whole performance to later import into your DAW or other audio app as 44.1kHz 16-bit WAV files. This is great for studio use and can form the basis of a new song idea very easily. 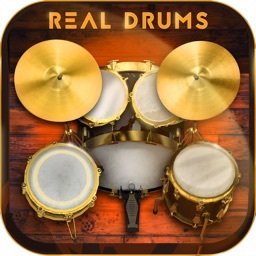 DrumJam supports export via iTunes file sharing, open directly in another app, email, AudioCopy, and export to SoundCloud. 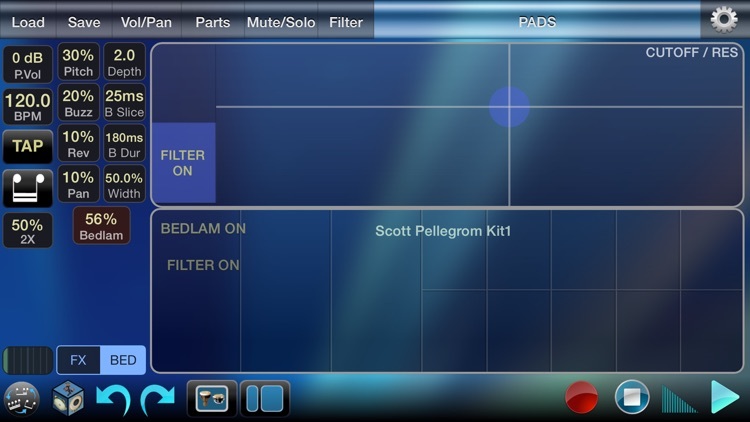 There is support for background audio, Audiobus, Inter-app-audio, and a MIDI implementation that supports clock sync in/out, and playing the solo kits externally triggered via MIDI input, or outputting your live pad performance via MIDI output! 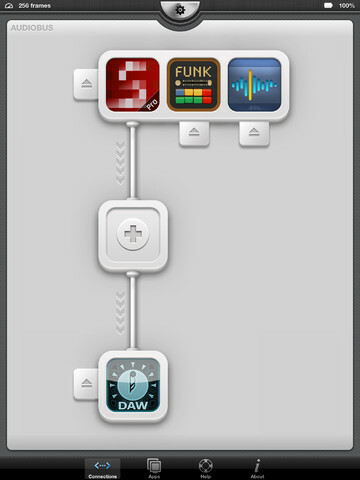 Also has Ableton Link support!